If you listen closely enough to the silence, you can always perceive something, and in that perception you will be receiving a message. This is one of the reasons why it is so important for all of you to unplug from your devices and get out into nature. This is why it is so important for all of you to stop thinking so much and meditating and going within more. The universe is always talking to you, but you have been trained to listen to other people and organizations, news outlets and preachers. You have lost touch with the sound that the universe makes. You want to hear a voice in your head coming to you from an ascended master or an archangel, but that’s only because you have been taught to value words over vibration, and sometimes even over the truth. We invite you to listen without expectation. Listen without having formulated a question. 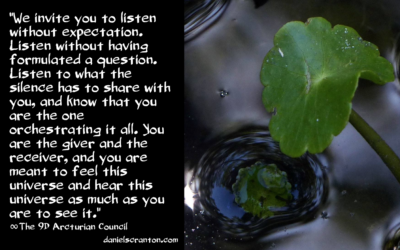 Listen to what the silence has to share with you, and know that you are the one orchestrating it all. You are the giver and the receiver, and you are meant to feel this universe and hear this universe as much as you are to see it. If you really want to understand your connection to all beings in this universe, you need to slow down and listen long enough to hear the call, to hear how the universe is summoning you. Certainly, there is a lot to be gained from being on the Internet and connecting with other people in all of the ways that you do with your devices, but you’re always only getting a fraction of the story. But when you tune in and listen, when you open up to receive, that is when you can feel the harmony of your song with the song of the universe.